The automotive x-by-wire systems are used for the replacement of the traditional controls of the vehicles which includes braking, steering, clutch mechanisms and throttle. The systems are equipped with the electronically assisted control mechanisms which eliminates the mechanical linkages involved in the system. There is variety of the x-by-wire systems. For instance, steer-by-wire technology is used for the replacement of the traditional steering technology. The x-by-wire systems integrate the control connecting systems with the high speed bus. The application of the electrochemical actuators by the x-by-wire systems is increasing the overall efficiency of the vehicle. Currently the global automotive x-by-wire systems market is observing vibrant growth on account of increasing number of cars using advanced sensor system, thereby driving the demand of automotive x-by-wire systems market. The growing demand for increasing efficiency coupled with rising safety concern in order to meet the governing compliances is anticipated to boost the growth of the overall market during the forecast period. The market can be segmented on the basis of vehicle type, technology and system type. On the basis of vehicle type, it is sub-segmented into commercial vehicles and passenger cars. The passenger cars sub-segmented is anticipated to be the fastest developing sub-segment during the forecast period. For instance, the sale of the passenger car in China was nearly 24 million in 2016 whereas it grew to 25 million in 2017.On the basis of technology, it is sub-segmented into park-by-wire, shift-by-wire, throttle-by-wire, fly-by-wire, brake-by-wire and steer-by-wire. On the basis system type, it is sub-segmented into suspension-by-wire, park-by-wire, shift-by-wire, throttle-by-wire and others. Shift-by-wire sub-segment is anticipated to witness significant growth during the forecast period. The increasing demand for the shifting of gear in order to enhance the gear mechanism is anticipated to drive the growth of the overall market during the forecast period. The growing demand for the lightweight and fuel efficient vehicles is anticipated to be the drive the automotive x-by-wire systems market. The growing technological development in order to reduce the overall weight of vehicles is anticipated to boost growth of the overall market. The reduction in the overall weight of the vehicles reduces the emission of the gases and increases the safety measures. The integration of the technology increases the accuracy of the vehicles which is highly precise. Thus, it is expected to be driver for the global automotive x-by-wire systems market. 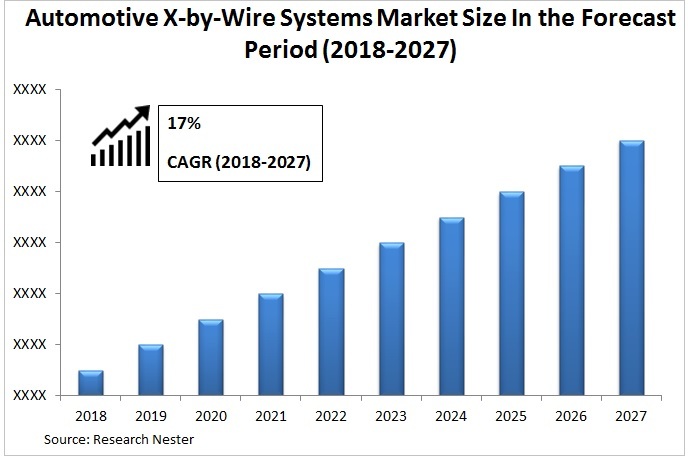 The growing research and development in order to develop more efficient system is anticipated to increase the investment in the automotive x-by-wire market. For instance, the advent of the intelligence transportation system includes the advanced technologies in order to enhance the driving methods. The reluctance to adopt the x-by-wire technology on the account of high cost associated with it is expected to hinder the market growth during the forecast period. On the basis of regional analysis, global automotive x-by-wire systems market is segmented into five major regions including North America, Europe, Asia Pacific, Latin America and Middle East & Africa region. North America is anticipated to be the largest region for the overall market. The growing adoption of the advanced technologies coupled with the presence of the key market players in the region is anticipated to drive the growth of the market in the region. Asia-Pacific region in expected to expand at the highest CAGR during the forecast period. The increasing demand for the passenger vehicles on the account of developing automotive sector in the region is anticipated to be the major reason for the growth of the overall market during the forecast period. Additionally, the promotion of the electric vehicles and hybrid vehicles by the government in the region is also a reason for the growth of the overall market. 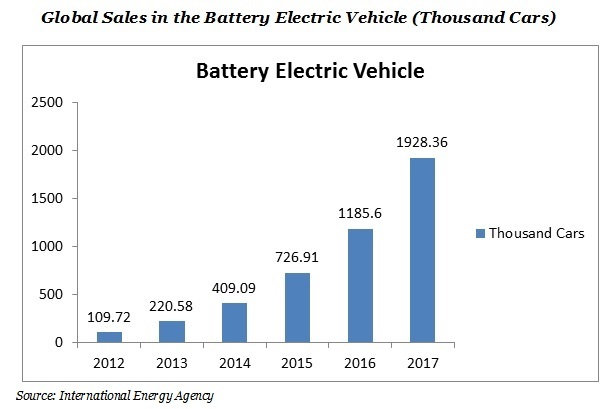 The growth in the battery electric vehicle has increased from 1185.6 thousand cars to 1928.36 thousand cars.